New Territories at the New York Museum of Art & Design is an ambitious survey of contemporary craft and design from Latin America. While many of the participants reward close attention, the work of Guillermo Bert is particularly intriguing. Bert is a Chilean artist who migrated to the USA during the Pinochet era. In his new home, he developed a career making politically-charged art, drawing on the use of barcodes as signifiers of restricted information. 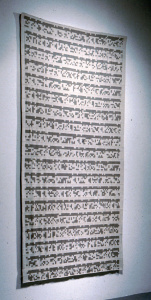 New Territories includes his work with Mapuche weavers from his country of origin. One of these, the 2012 work Redemption, is produced collaboratively with the weaver Anita Paillamil. 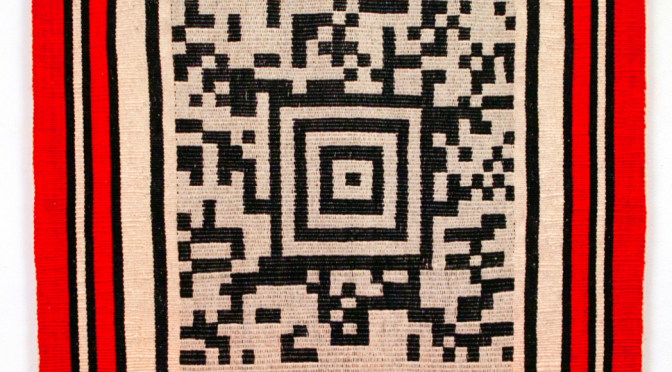 Rather than traditional symbols, it features a QR-Code that links to a Mapuche myth. 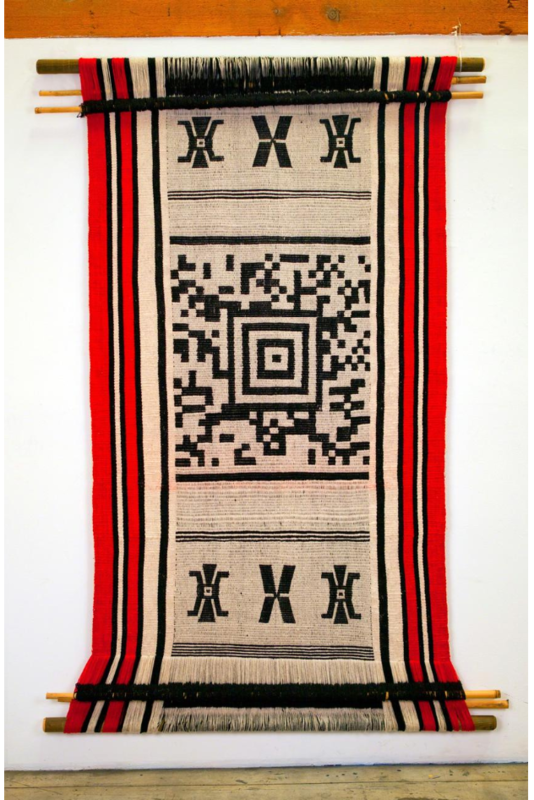 The work therefore is a testament to Mapuche culture both in the woven object itself and also the story that it encodes. What in his previous work was an emblem of repressive secrecy now becomes an important transmitter of cultural values. Somos prueba de que aun existe en el siglo XXI un pueblo ancestral. We are the proof that in the 21st century, an ancestral nation still exists. The video depicts quite a fascinating collaboration. At first it seems a forced exercise. Bert seeks to have his design realised by a Mapuche weaver in Chile, but his agenda doesn’t seem connected with their own reality. Do they know what a QR code is? Will they ever get actually to see the work in the US gallery? Modern art is filled with examples of first world artists using artisans as extras for their conceptual adventures. But Bert seems to take it further. As the story unfolds, Bert travels to the weavers and seems to develop an understanding with them. He even invites one of them to travel to his Los Angeles studio so they can be in closer contact. As the video shows, Anita Paillamil is quite excited to be given this opportunity. And other Mapuche figures (I recognise the journalist Elias Paillan) seem keen to use this work to share their stories. It has the makings of a real collaboration. 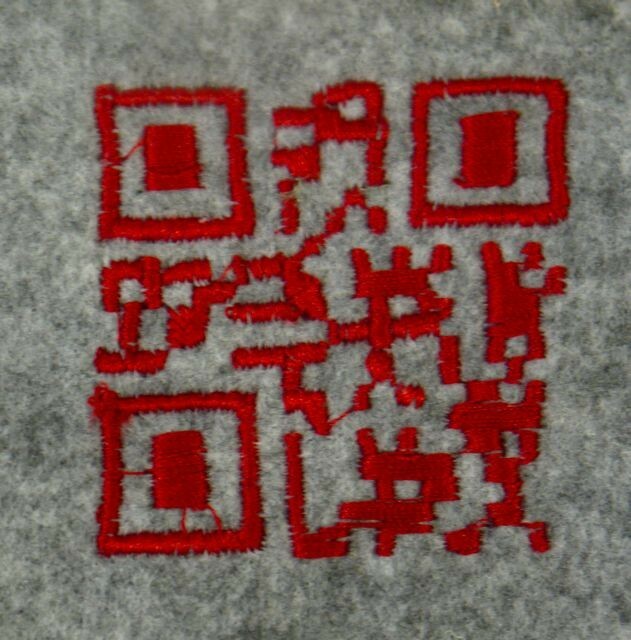 Bert continues a line of experimentation in weaving with digital code. In 1998, US artist Gwendolyn Zierdt started a remarkable series of works that played on the inscrutability of digital role. 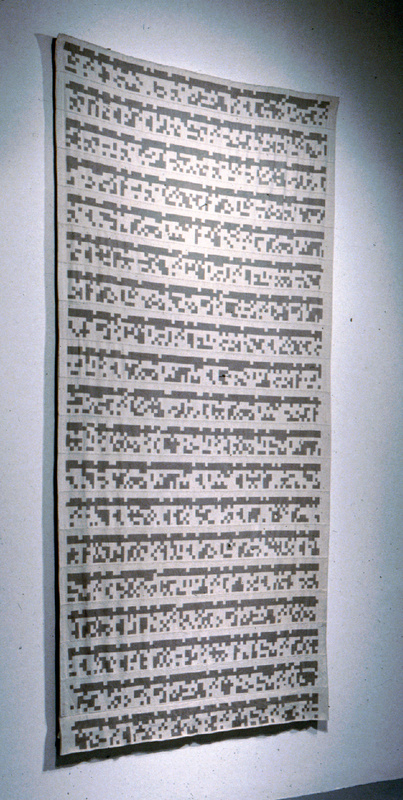 She translated the Unabomber Manifesto, which was about the decline of handskills, into a binary code that was then woven as a tapestry. It was a defiant proclamation about the co-existence of craft and technology. goods, such as fairy tales on pillows and local wisdoms on grocery bags. The work is not only about the application of new technology to weaving, but also the relational possibilities it makes possible as stories of shared significance can be embedded in the object. What makes Bert’s work different is the cultural partnership. The QR Code links the Mapuche village with the urban centres of the wealthy North. It is a message in a bottle. But like all collaborations between rich and poor, we are left with many questions. Is it useful to know how much and on what terms the weaver was paid? The wide gulf between the artisan payment and final sale price is often the cause of an awkward revelation after the initial excitement of craft-design collaboration. There are many valid reasons for a large mark-up – conceptual labour, investment of time and travel, rent, risk, etc. Of course, too much talk about money can detract from the personal relationship between an artist and artisan. While other artists like Alighiero Boetti do not acknowledge their artisans, Bert is quite overt about the role of Anita Paillamil. This is a welcome gesture that adds greatly to the meaning of his work. But it seems important that our interest doesn’t stop there. Might Anita Paillamil take this further in her own work? Could she exhibit a similar weaving of her own in Santiago? It would be interesting to see if Bert’s work could inspire new work and make new pathways for Mapuche weavers in his home country. Perhaps they could have a more overt involvement in the messages carried by the QR Code. Bert has cast the shuttle wide in his Coded Stories. But there are many more passes to come before the potential of these digital tapestries is fully realised. 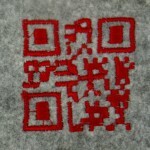 QR-code have capacity to unlock the secret life of objects. Scan this space.